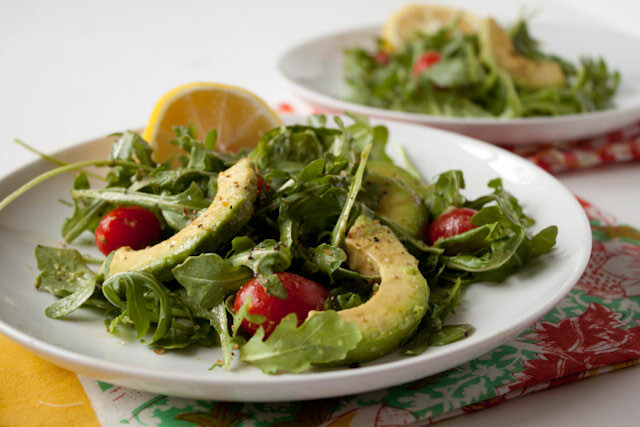 This arugula avocado salad has the brightest lemon vinaigrette. The salad is light, creamy, and just about the loveliest side I can think of for a dinner party, but you can also add some heartiness with beans, chicken, salmon, or shrimp, too! OK, I admit it; this recipe is simple. It’s light, too, and that whole fluffy-puffy-pile-of-greens state of existence is just generally not for me, because my salads? They rarely weigh less than, oh I don’t know, say, a half-pound cheeseburger? Just a guess. So this fairly dainty plateful is a far cry from the norm. But I assure you—it’s downright delicious. A side dish, probably. A starter, maybe. But so, so fresh and perfect in its purity. What makes it special is the combination of a precious few high quality ingredients. Strangely enough, I chose arugula as the base—arugula, the same leafy green that, until yesterday, I had absolutely no love for whatsoever. It was always too peppery, too bitter. Now, paired with creamy cool avocado and the concentrated sweetness of cherry tomatoes, it’s mellowed. Milder. I even welcome its spiciness in contrast to the rich avocado. To bring all of these flavors together in a balanced, complementary way, I whisked together a garlicky lemon Parmesan vinaigrette—made with a fruity, good quality extra-virgin olive oil. This is the appetizer salad you’ll want to prepare when guests come over for dinner. This is the one you can add grilled chicken, shrimp, steak, chickpeas, or tofu to, for satisfying bulk, and call a complete meal. A tip: Add a light sprinkling of coarse sea salt and freshly ground black pepper to the tops of your simply dressed salads from now on for a fantastic new dimension of texture and flavor. In a small bowl, whisk the lemon juice, garlic, Parmesan, salt, pepper, and olive oil until well combined. 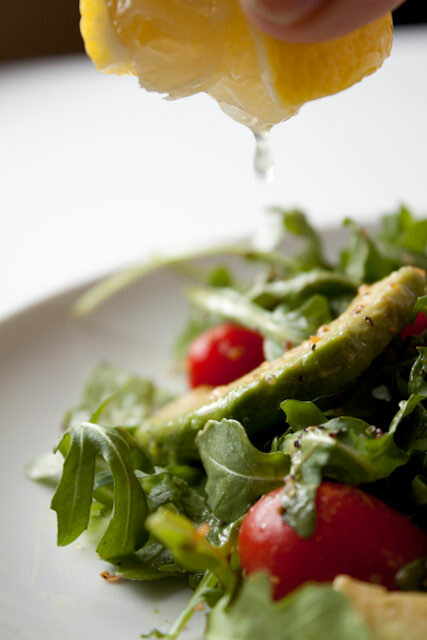 In a large bowl, combine the arugula and cherry tomatoes. Add the dressing and toss to lightly coat all of the leaves. To serve, divide the dressed greens and tomatoes among four serving plates. Slice the avocado and divide the pieces evenly on top of each salad. Sprinkle a pinch of sea salt and pepper over the tops if desired. yum! im making one now. Yes, yes and yes. Love this for a pre-meal salad. Especially in light of summer! 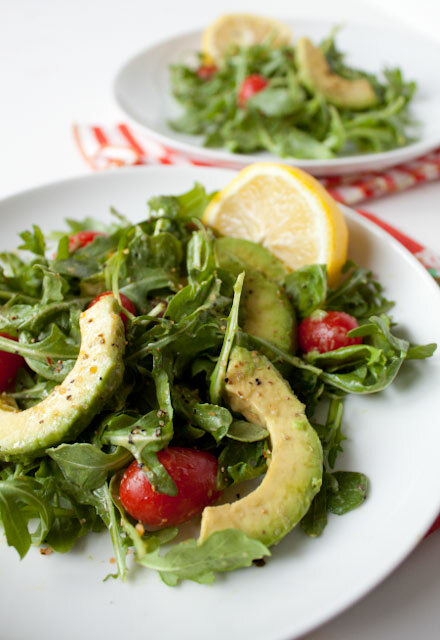 arugula is my current favorite and this looks simple and delicious! Love that dressing! It sounds like it pairs perfectly with the avocado! Hi Andie- I love your website! 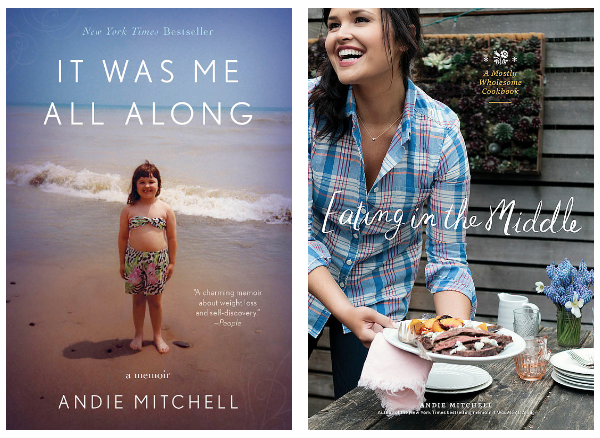 Are you writing a book about your experiences so far, and if so, when will it be released so I can get one? I just want you to know how much I appreciate your sharing your story. The way you are able to verbalize your feelings and thoughts, feels so familiar to me, and I always love reading your posts! Yum! 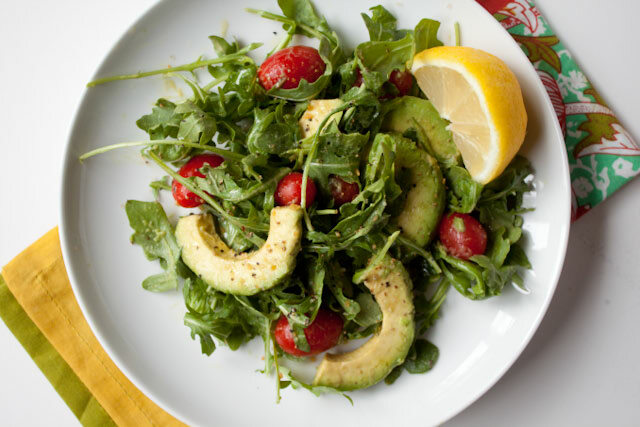 One of my favorite salads is diced tomatoes & avocados (mixed together w/ some salt & pepper) on top of arugula – this salad kicks it up a notch and makes it presentable for company :-). (I would not serve mine to guests, it is pretty messy looking ;-)). This looks great! What a way to welcome summer days! I know it’s a little early, but yesterday and today it is in the 90’s in St Louis. What a delicious looking salad! This would be the perfect side salad for a summer-y dinner outside. I can just smell the grill … Thanks for sharing! I freaking love your site and all your recipes. I happen to come across this and am so happy to see your site was placed 21st out of 100 Most Inspirational Weight Loss Bloggers of 2013!! I came across your site and this recipe and (yay!) I had all the ingredients to make this wonderful salad. Dressing is whipped up and ready to go, just waiting for hubby to get home to grill some chicken! thanks so much! Mmm, lemons, arugula, avocados, and tomatoes are all among my favorite foods. Great looking salad! This sounds amazing! I’m planning to try this without the cheese! This salad is so delicious, we made it three evenings in a row for dinner:) The combination of lemon, parmesan and garlic is amazing! Noni, thank you! So glad to hear you tried it and liked it!! About the email- I don’t recall seeing one from you? Can you resend? This is where I sent it to, should I try another adress or resend it to this one? I made it for my family and they loved it. Arugula, avocados, and tomatoes are all my favorite. Great salad, thank you SO much!!! Very delicious! I cooked some quinoa, added some craisins and poured about 1/2 the dressing on this first. I plated each salad with greens, quinoa mixture, halved cherry tomatoes and avocado. Served with additional dressing (if desired) and freshly grated salt and pepper. Will definitely make again! That’s wonderful to hear! Thank you Julie! I love your additions, too!